OH SUSANNAH, a traditional song composed by Stephen Foster in 1840 is a song that lends itself to choral part singing. I arranged this in a jazz style as I have a real interest in unusual chords and the jazz genre. The setting is for five parts, Soprano 1 & 2 with splits; Alto 1 and Alto 2. There is also an SATB setting of the song. The two arrangements are available from my publisher here, Middle C associates in Geelong Victoria. From the publisher: This stunning treatment of the 1848 Stephen Foster classic was crafted by one of Western Australia’s most talented composers and arrangers of choral music. Featuring tight jazz influenced chords and interesting harmonies, Christian achieves an uplifting, reflective, almost spiritual sound. The arrangement contains an optional piano part and is available for treble SSAA or mixed SATB choirs. Click here to hear OH SUSANNA performed by the Iona Presentation College Chorale. A Profile of the Early days of Rock ‘N Roll from 1956 – Present Day. Which bands did you play in, and when? I started drumming in a band called Four of a Kind while still at school in Year 11 at Trinity College in East Perth in 1965. We used to play a lot of dances and university functions in the old Barrack St Jetty Rowing Club and all of the school socials. It was that year I started to teach myself guitar and (on guitar) formed the Jeff Phillips Fan Club band with Jeff Phillips. We regularly played at his fan club dances in South Perth. When I left school at the end of 1966, I formed a band called The In-Pulse with Peter Waterman, Bob Hawker, Ian Love (of Cocos fame) and Dave Sears. (See photo above, Rod Christian far left.) This was a great band with harmonies and lots of work around the Perth scene. A regular gig was St Pat’s dance every Sunday night in Fremantle, plus dances and cabarets around town including The Italian Club in North Perth. We often did river cruises to Point Walter on a Saturday night and supported bands at nightclubs in Perth. I played lead guitar along with Nigel Ridgway, Jon Burns, Ron Burns and Brian Ward in The Blue Brass at the Nanking restaurant in Belmont from 1968. We backed many international artists including The Platters, The Sitopal Sisters, Four Kinsmen, and Martin St James etc. This is where I learned to read music (basically by ear) and also to play bass guitar, as we used to swap instruments to keep the music going. It was a lot of fun working with Peter Harries, Kelly Green, Ian de Souza (now a prominent Fremantle artist) and Elaine Mort, amongst other local musicians. In 1969 I left The Blue Brass and formed The Motivation with Russ Kennedy, Nigel Ridgway (then Maurie Pearson), Peter Waterman and John Quilty. In this band I played lead guitar and keyboards. We played the Swan Hotel circuit in Perth and many nightclubs including Top Hat, Ricki Tik, Two Eyes, The Colosseum and more. In 1971 I joined Triax at the Morley Hotel as bass player. We played four nights a week and then we got the job as resident band at Contacio International in Scarborough. Here, Peter Harries and Kelly Green were the floor show artists and in 1973 Peter started his own nightclub, The Knight Klub in Como, where I joined him as musical director for the next nine years. I still play in five different bands today including the original In-Pulse which works under the name Cruisin’ Rock ‘n Roll Showband with three of us original members still in the band! What got you into rock and roll? Is there a gig that really stands out in your memory? There were many, particularly backing famous people. 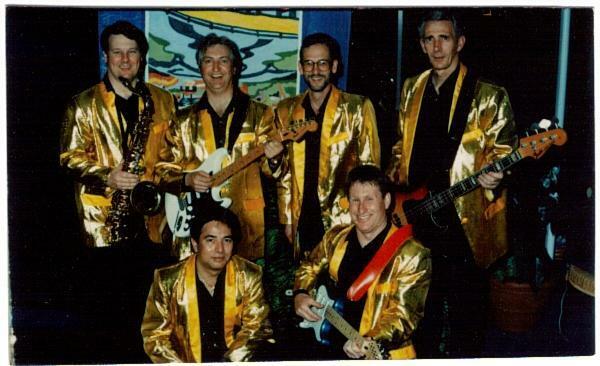 In the early days I was playing bass in the main backing band for Telethon with Ed Peters and Guy Bart and we used to back people like John Farnham, Cleo Lane, Johnny O’Keefe and Little Patti. It was all live to air, so exhilarating and at the same time frightening. I remember being support band to Gary Pucket and the Union Gap and to the Deltones. A memorable gig was backing Harry Secombe at Perth Concert Hall and Warren Williams, Johnny Young, and Ray Brown in subsequent gigs. I also went to many great gigs including Peter Frampton, Doctor Hook, Boz Scaggs, Paul McCartney, and, more recently conducted a season of my own musical Cruisin at the Regal Theatre in Perth as Musical Director, with Glenn Shorrock in the lead role. I also write heaps of choral music. A memorable occasion was back in 2002 when 9000 people heard a world premiere of a song I composed called ‘Anthem for Unity for Australia’ at the Perth Entertainment Centre. What was guaranteed to get audiences off their seats and dancing? Rock and roll of course! The simplicity, the harmonies, the great string arrangements, the backup vocals all combined to make this a unique genre. I have a very broad taste in music but you can’t beat good old rock and roll. I particularly like the backbeat and the tempo of jive music. Jive, Twist and Stomp (December 2010) is available from Fremantle Press.